Drogheda Rotary Club was well represented at the recent Drogheda Chamber of Commerce Business Excellent Awards. The gala event attracted 360 guests at the City North Hotel, Gormanston. 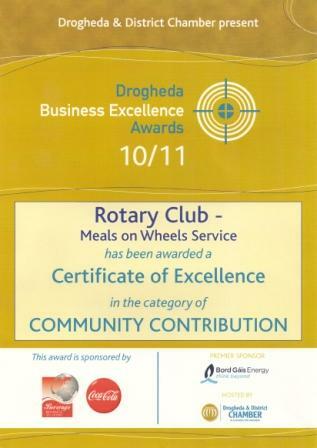 Drogheda Rotary received the nomination under the Community Services category because of the Meals on Wheels service. A big thanks to rotarian Karen Smyth for all her hard work in getting the nomination & the recognition.